Carmen is a native of Mexico City and has always loved dealing with people. She has worked as a translator and an English and Spanish teacher, as well as in public relations and international commerce. She worked at the Mexican Embassy in London for 5 years, where she always promoted Mexico as a great destination. 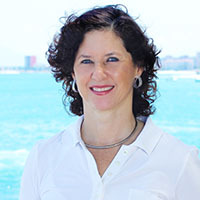 She moved to Puerto Vallarta in 2002, and 2 years later she became a real estate agent. She is a member of AMPI, the Professional Mexican Real Estate Association, and participates regularly in training courses to update her real estate knowledge to always give a professional service. At the end of November 2010, she took the CIPS course, to become a Certified International Professional Specialist. She likes writing articles and taking pictures of the beautiful nature around her. The magic of this area and the friendliness of its people is something that captivates her and she considers PV a wonderful choice for a perfect lifestyle. “For me, looking at the ocean and the beautiful mountains every day is a real gift. I really enjoy living here”.